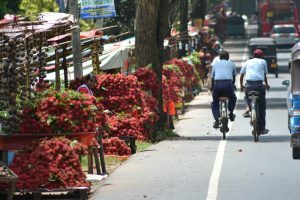 It’s that time of year again in Sri Lanka where the streets are turned red with many stalls at the side of the road selling the rambutan fruit. In some places it can be such a spectacle!! but what exactly is it? The Rambutan tree grows to about 10 to 20 metres in height. Its alternate leaves are 10 to 30 cm in length and pinnate and have three to eleven leaflets, each with an entire margin about 5 to 15 cm in width and 3 to 10 cm in breadth. Petal-less small flowers which are about 2 1/2 to 5 mm in size are disk-shape and they bloom cluster wise. The shape of the Rambutan fruit is round or oval and it is about three to six cm by three to four cm in dimension. 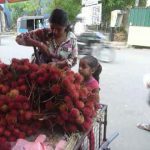 Rambutan is borne in clusters, and about 10 to 20 Rambutan fruit can be present in a typical cluster. Its leather like skin has pliable thorns. Rambutan fruit is typically red though some are yellow or orange. ‘Rambut’ is a Malay word that means ‘hairs’, hence it gets its name because of the thorn like appearance of its fruits. Its brownish seed is about two to three cm in size and is basally scarred. It is soft and crunchy. Although the raw seeds are poisonous, they may be eaten after cooking. Open Rambutan fruit by removing one part of its skin. Find the seam across the fruit and pull apart the leathery skin. You can also use the knife, but be careful, only cut through the skin. Then you can hold the fruit with your fingers and enjoy the sweet taste. 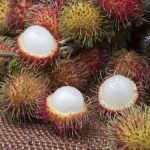 Rambutan fruit cannot be cooked; it can be eaten raw only.